Background: Since 2013 Cannabis-based preparations, containing the two main cannabinoids of interest, Δ9-tetrahydrocannabinol (THC), and cannabidiol (CBD), can be used for therapeutic purposes, such as palliative care, neurodegenerative disorder treatment and other therapies. The preparations may consist of a drug partition in sachets, capsules or through the extraction in certified olive oil. 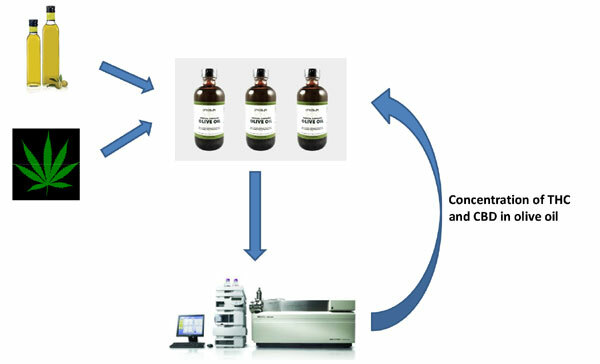 Objective: The aims of the study were: a) to develop and validate a new liquid chromatographictandem mass spectrometric (LC-MS/MS) method for the identification and quantification of THC and CBD in olive oil; b) to evaluate the extraction efficiency and reproducibility of a new commercial extractor on the market. Methods: The olive oil was simply diluted three consecutive times, using organic solvents with increasing polarity index (n-hexane → isopropanol → methanol). The sample was then directly injected into LC-MS/MS system, operating in Multiple Reaction Monitoring Mode, in positive polarization. The method was then fully validated. Results: The method assessed to be linear over the range 0.1-10 ng/µL for both THC and CBD. Imprecision and accuracy were within 12.2% and 16.9% respectively; matrix effects proved to be negligible; THC concentration in oil is stable up to two months at room temperature, whenever kept in the dark. CBD provided a degradation of 30% within ten weeks. The method was then applied to olive oil after sample preparation, in order to evaluate the efficiency of extraction of a new generation instrument. Temperature of extraction is the most relevant factor to be optimized. Indeed, a difference of 2°C (from 94.5°C to 96.5°C, the highest temperature reached in the experiments) of the heating phase, increases the percentage of extraction from 54.2% to 64.0% for THC and from 58.2% to 67.0% for CBD. The amount of THC acid and CBD acid that are decarboxylated during the procedure must be check out in the future. Conclusion: The developed method was simple and fast. The extraction procedure proved to be highly reproducible and applicable routinely to cannabis preparations. Keywords: Δ9-tetrahydrocannabinol, cannabidiol, therapeutic cannabinoids, olive oil, LC-MS/MS, cannabis preparations. Keywords:Δ9-tetrahydrocannabinol, cannabidiol, therapeutic cannabinoids, olive oil, LC-MS/MS, cannabis preparations. Abstract:Background: Since 2013 Cannabis-based preparations, containing the two main cannabinoids of interest, Δ9-tetrahydrocannabinol (THC), and cannabidiol (CBD), can be used for therapeutic purposes, such as palliative care, neurodegenerative disorder treatment and other therapies. The preparations may consist of a drug partition in sachets, capsules or through the extraction in certified olive oil. MicroRNAs in Neurocognitive Dysfunctions: New Molecular Targets for Pharmacological Treatments?